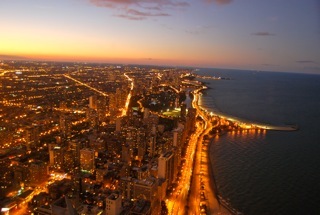 From the 10th floor of your hotel, you look down on Chicago’s Michigan Avenue and the Magnificent Mile as the city comes to life. Anchored on the south by the Chicago River and on the north by the John Hancock Tower, “The Mile” is known for its posh, trendy stores and classy restaurants. Walking to the elevator, you wonder if it’s possible to find an inexpensive breakfast amidst such opulence. The grumble in your stomach reminds you to stay on task. Mary’s Café is a narrow, one-story brick structure, easily missed if you’re in a hurry. Located at 215 East Grand Avenue, Mary’s is open every day from 6:00 a.m. until 3:00 p.m.
“Sit anywhere you want,” a smiling waitress says, gesturing with a carafe of coffee. Mary’s specializes in “skillets:” Sausage or Bacon Skillet, Veggie, Italian, Chicken Fajita and Corned Beef Hash Skillet. There are also omelets and a variety of sides. Almost everything costs less than $12. You order the Corned Beef Hash Skillet, covered with two eggs, toast and tea ($11). Served within minutes, it’s hot, delicious and filling. Sated, you spend the morning strolling The Mile. Like your lunch with a twist? 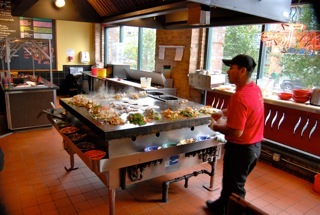 Try Flat Top Grill, located at 1000 W. Washington Boulevard. 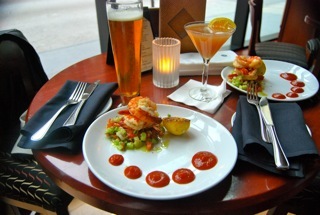 A 10-minute taxi ride from The Mile, the Grill offers an impressive array of vegetables, meats and seafood. Moreover, the Grill lets you mix items according to your palate. A waitress whose smile could melt a glacier guides you to a counter where you pile veggies and chicken into a bowl, then watch as the chef cooks it on a four-feet by four-feet grill. It’s served steamy hot, under a thick, grilled tortilla. Cost: $8.99. Other meals range from $4 to $15. Later, after touring Chicago’s Millennium Park and renowned River Walk, you’ve worked up an appetite. Fleming’s Restaurant is the place to go. Located at 25 East Ohio Street, Fleming’s is only two blocks from The Mile. Fleming’s is known for its fine dining. But, if you get there between 5:00 and 7:00 p.m., you can order from the “5 for 6 ’til 7” bar menu. You can choose from five cocktails, five wines and five appetizers, each for $6, until 7:00 p.m. Carnivores craving something simpler can order a burger with cheese and bacon for the same price. Don’t care for cocktails or wine? You can grab two imported beers for only $6 each. You decide on the shrimp cocktail: four grilled jumbo prawns, their tails intertwined, piled upon a mound of finely chopped onion, celery, cucumber, and cilantro, then drizzled with a balsamic vinaigrette. Five dollops of cocktail sauce and half a grilled lemon finish the presentation. After a hard day’s frugal eating and Olympic sightseeing, a warm smile and a chilled glass of wine would hit the spot. Get both at the 676 Lounge. Located on the 4th floor of the award-winning Omni Hotel, the Lounge is a secluded piece of tranquility belying the fact that it overlooks the hustle and bustle, just 40 feet below, on The Mile. You can sit at the bar or take an intimate table with a view. Wines range from $10-$11 by the glass, but after all the money you’ve saved today, you can afford it.